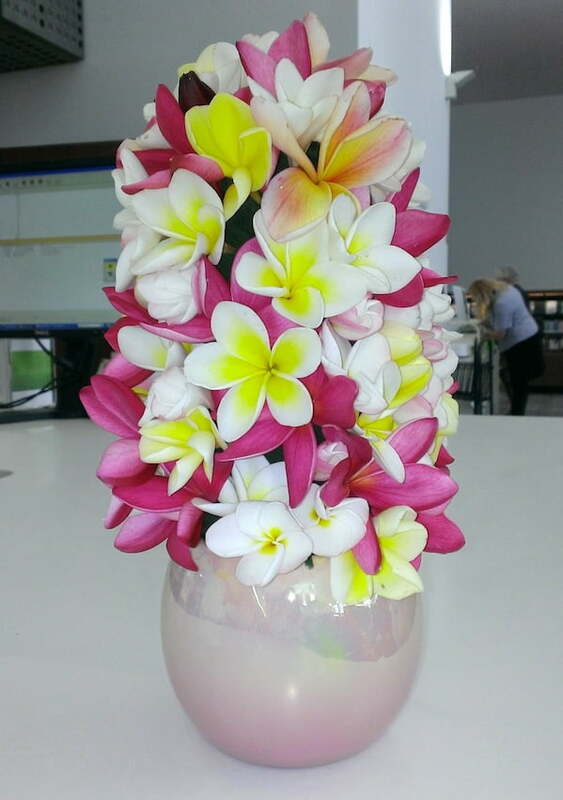 Nothing says “Christmas’’ to me quite like frangipani flowers. The soft, sweet-smelling “frangis’’ tip me into memories of balmy Brisbane summer evenings, with the pleasing umbrella-shaped trees dropping beautiful blossoms on the lawn and festive tables dressed with bowls of rich, creamy five-petal flowers, their fragrance permeating the house. They are most commonly white or cream with yellow throats, but there’s a range of colours from deep crimson to orange, yellow, pink and white and every shade in between. The further north you go in Australia, the wider the colour choice. I have four on my plot and am always looking to increase my “family’’. 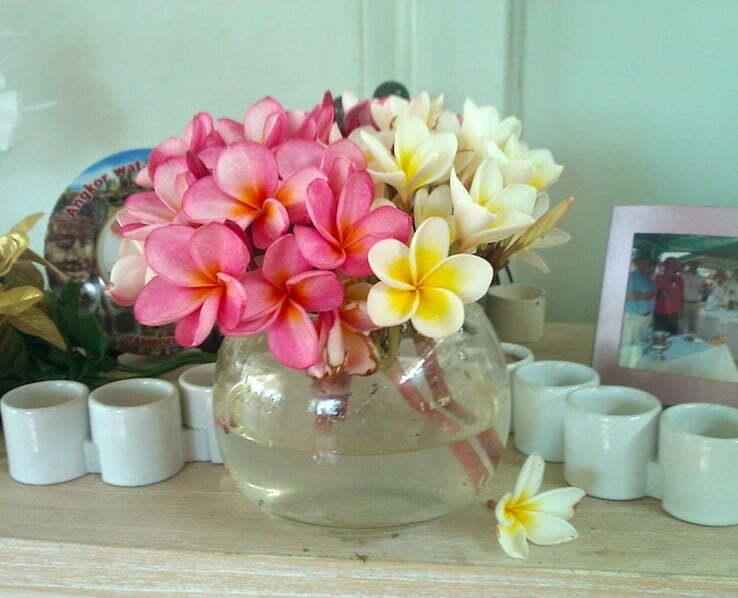 As a child, it was my job to knock up our neighbours on either side on Christmas morning for a bunch of frangipani (left) or hydrangea (right) for our lunch table and I always veered left at our gate first. The only downside to picking them was the sticky milky (poisonous) sap that bled on to my hands. Years later, I still associate them with the smell of roast stuffing. They also made up the only bridal bouquet I ever caught. See? Frangi bonding was a given with me. 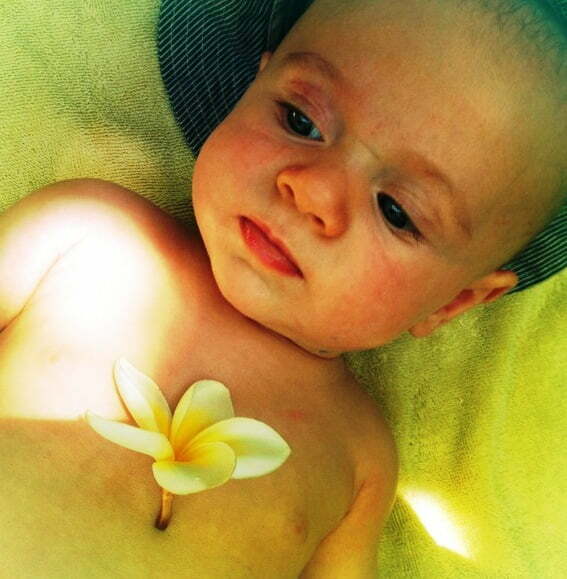 Doesn’t this little guy look Zen? Their dainty waxy blooms evoke Hawaiian leis, fragrant offerings to Buddha, restful decorative touches at Eastern spas and Balinese resorts that say “Chill!’’. Thai people wear them on special days such as Thai New year. If a Polynesian woman tucks one over her right ear, she signalling she’s available. If it’s the left ear, she’s taken. 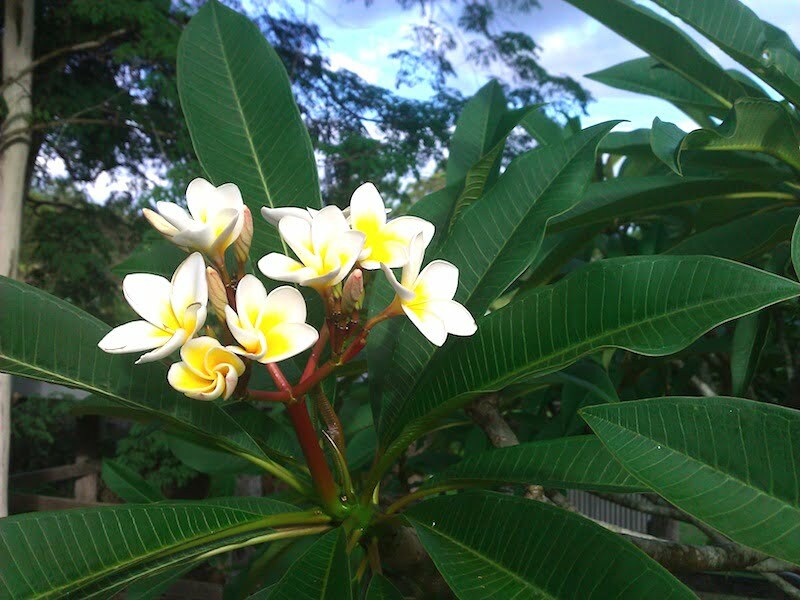 The frangipani is the national tree of Laos and regarded as sacred. Every Buddhist temple there has one planted in the courtyard. Many are hundreds of years old, spectacular, huge, gnarled giants. Plumeria rubra and Plumeria acutifolia are the most common frangipani and are native to Mexico and Central America and came to Australia via Polynesia, Melanesia and New Guinea in the late 1800s, with the missionaries. They are deciduous trees, often as wide as they are high. Generally, they grow to about eight metres high and spread to about four, with an attractive dome habit. They’re popular especially because they are so hardy – practically no-care, withstanding neglect, heat and drought, insect and pests. You can’t even burn them at temperatures of less than 500 degrees C. The same no-fuss rule applies to their propagation. Just snap off a twig and plonk it in the ground – after letting it “dry’’ for a few weeks first. It’s one of the easiest plants to grow from a cutting. They have a well-behaved root system and flower for about six months. They give great shade and even bare in winter, frangipanis have an interesting structure and as they allow maximum sunlight under their canopy then, are great for underplanting and are especially good hosts for dendrobium orchids. Charles Plumier, a 17th Century French botanist lent it its botanical name. And Frangipani owe their name to Italian nobleman Marquis Frangipani, who created a perfume used to scent gloves in the 16th century. 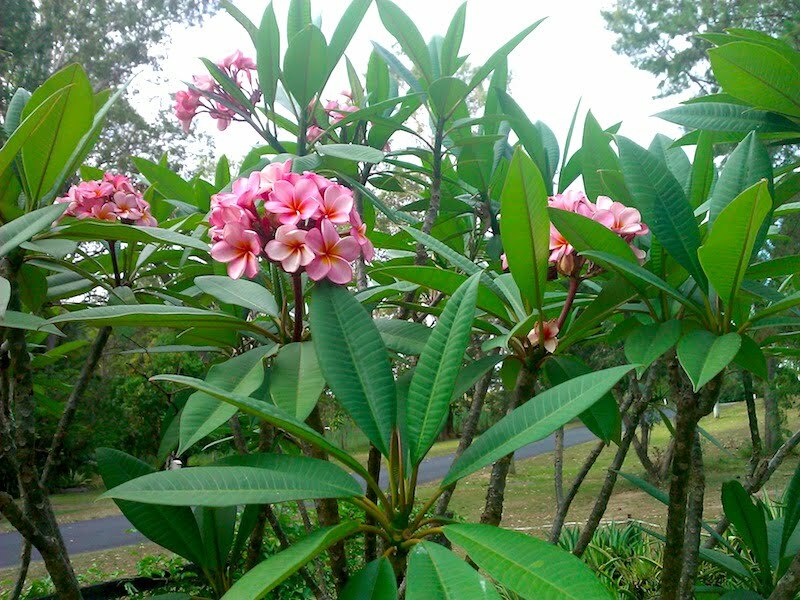 When the frangipani flower was discovered, its natural perfume reminded people of the scented gloves. I defy you to walk past a bowl of frangi without dipping your nose into it – as I did when our local librarian put this gorgeous multi-hued arrangement on the counter this week, made with a slab of florist sponge standing in a vase into which she pushed the stems to make a vertical display that was …………..aaah. Float some in your bath and pretend you’re in Bali this Christmas. And have a happy one. The frangipanis have just started to flower here in Sydney. It’s delicious when you catch that first scent! There’s such great trees for restricted root spaces too, in pots, courtyards and around pools.